While the 2015 Kia Soul EV is another Compliance Car (thank you, California Air Resources Board), it’s one of the best electric cars currently available. 2015 Kia Soul EV in Black with Inferno Red trim. Sharp! A few years ago, when I drove the Nissan Leaf for the first time, I was struck by just how ordinary the Leaf was. If you set aside the electric powertrain, the Leaf drove like any other compact car. It all seemed familiar until you realized that the road noise was so pronounced because you couldn’t hear the the engine humming and the transmission spooling up and shifting. There was no exhaust note. Nothing but annoying road noise that would have gone unnoticed if it were a conventional car. One observation is clear: The Korean Twins – Hyundai and Kia – learn fast. Their products bristle with fresh design, great drivetrains, tons of tech and best-in-class-warranties. They are no longer a generation or two behind the Japanese. These days, the Japanese scramble to keep up with them. The 2015 Kia Soul EV is a prime example of how well the engineers and designers studied the competition and went the extra mile. Kia’s first EV is instantly top of the class. 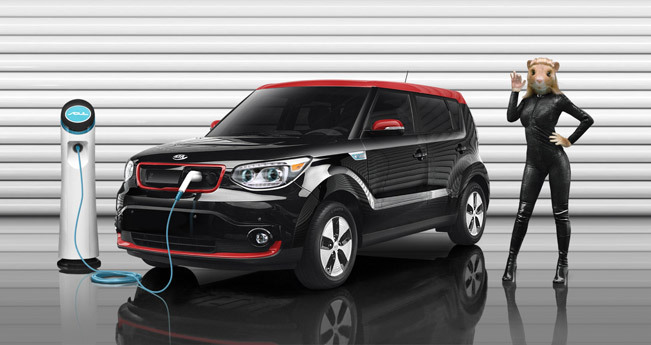 The 2015 Kia Soul EV looks sharp and cheeky from any angle. What’s not to love here? It’s a little 2-box rectangular wagon with a sloping roof that’s too tall to be called a sports wagon and not high enough off the ground to be a crossover. Hell, it’s not even available with all-wheel drive. But its cheeky face, fresh styling and utilitarian format made it a smashing success (115,579 units for the first three quarters of 2014 alone) not just with the coveted “hip urban youth” demographic, but a very wide base of buyers. Who doesn’t love the Kia Hamsters? This fetching lass is showing you how to charge your Soul EV. The 2nd generation Soul was introduced for the 2014 model year. Subtle styling changes were made to the exterior and the interior received a thorough refresh. But Kia was careful not to mess too much with the original formula. That wild boar still dares you to love it. The new Soul platform was designed to accommodate both ICE and EV powertrains. The thin, 27 kWh lithium-polymer battery sits flat under the seats in the floor pan. As with other EVs like the Nissan Leaf or the Tesla Model S, the extra weight of the battery – almost 500 pounds) serves to lower the center of gravity, balance weight between the wheels and more firmly plants the little wagon through curves and in wind. The EV gets additional suspension turning and increased torsional rigidity. All of these extra benefits and engineering make the electric Soul the one to get if its limited range isn’t a problem for you. 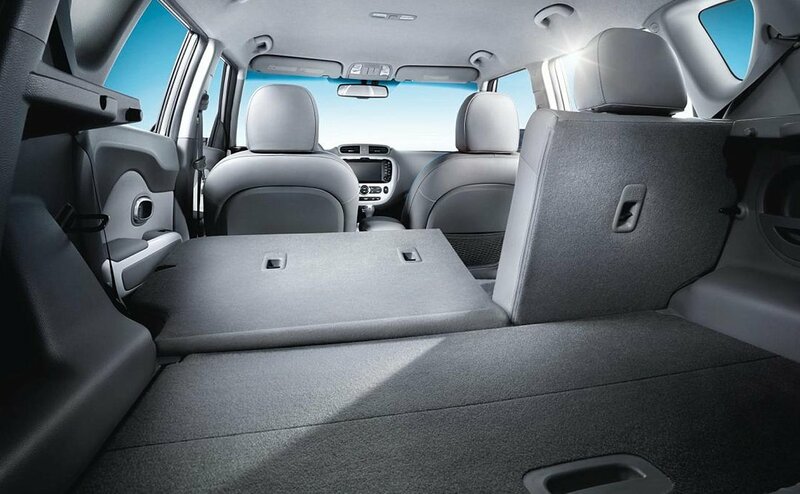 The cargo space in the Soul EV is similar to the Toyota RAV4 EV. It’s not as big, but it’s got plenty of space for most shopping trips. The 2015 Soul EV is EPA-rated at 105 MPGe (33.7 kWh of electricity is equivalent to one gallon of gasoline, but who cares?) with a range of 93 miles. The range is the most important number here and it’s the best range of any pure EV sold today that isn’t a Tesla. Better than the BMW i3, better than the VW e-Golf, better than the Nissan Leaf. The excellent standard UVO navigation system can guide you to public charging stations, much like the Leaf and some other more expensive EVs. 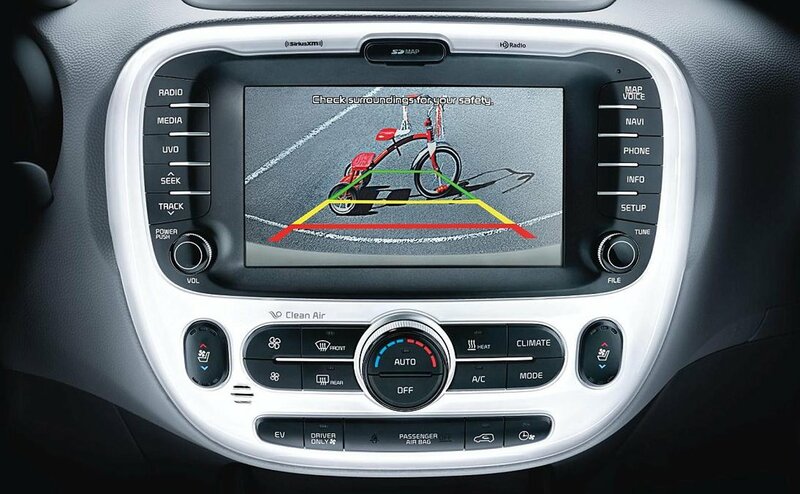 The Soul EV comes completely loaded with navigation, HD radio, SiriusXM Satellite radio and a backup camera with guides. This is the EV+ with front and rear parking sensors and ventilated front seats (note the controls). The plastic fascia is a bit cheap. I drove the Soul EV in heavy traffic around Glendale – not too different from the normal traffic in and around West Hollywood/Beverly Hills. So I didn’t get a chance to go on an open road or fast on the freeway. While the 81.4 kW electric motor is only rated at 109 hp, it packs 210 lb-ft of torque, instantly available, so it “feels” fast. I’ve seen estimates that the zero to 60 time is a positively glacial 11-12 seconds. But on surface streets, I found it quick and quiet with a smooth, relaxed ride. The seats comfortably fit my 6’1″ frame and visibility was pretty good all around. 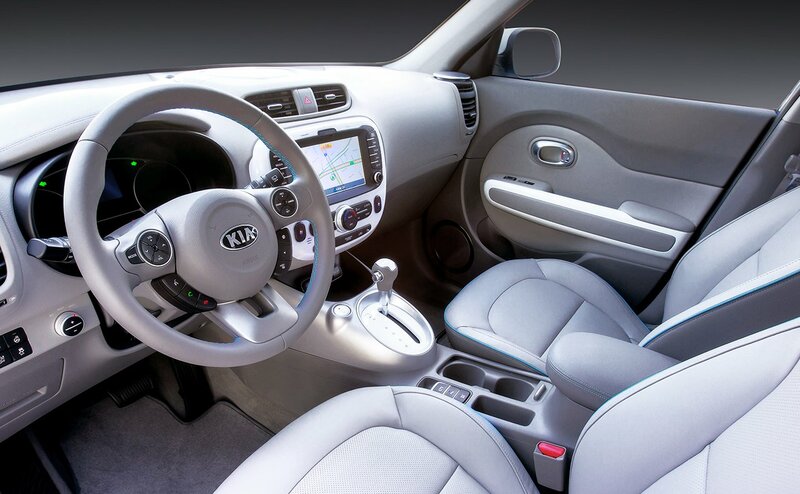 2015 Kia Soul EV’s instrument panel is completely digital. The B mode dialed in fairly strong regenerative braking — strong enough to stop the car at slow speeds. How much it actually adds back to the battery is questionable, but you feel good playing the “look ma, no brakes” game. The mechanical brakes that actually hug the wheels were strong and linear, with no spongy feel. One thing I’ve read about regenerative braking is that you should be aware that if you don’t touch the brake pedal, the people behind you don’t realize you’re braking. So it might be a good idea to lightly use the brake pedal along with the regenerative coasting. This is the upgraded interior of the Soul EV+ with perforated leather seats. The electric blue piping around the seats is a nice touch. I was surprised by how much resistance was calibrated to the accelerator pedal. That’s easy enough to get used to, but that was your first reminder you weren’t in gasland anymore. Everyone complains about the numb steering, and they’re right, it’s pretty numb. But I have fairly low expectations for electric power steering these days and the Kia’s wasn’t any worse than anything else I’ve driven. 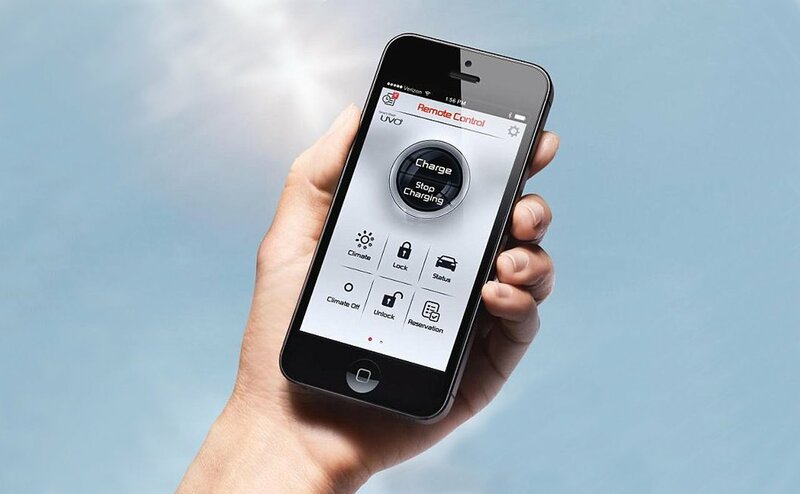 All EVs have a complimentary Smartphone app. 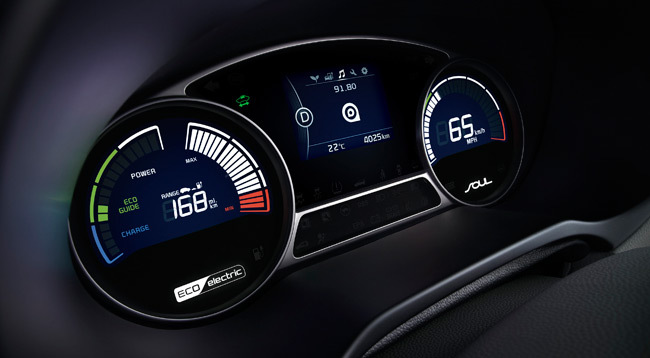 The Soul EV’s basic app allows you to check the charge level, set the climate controls and lock/unlock the doors. 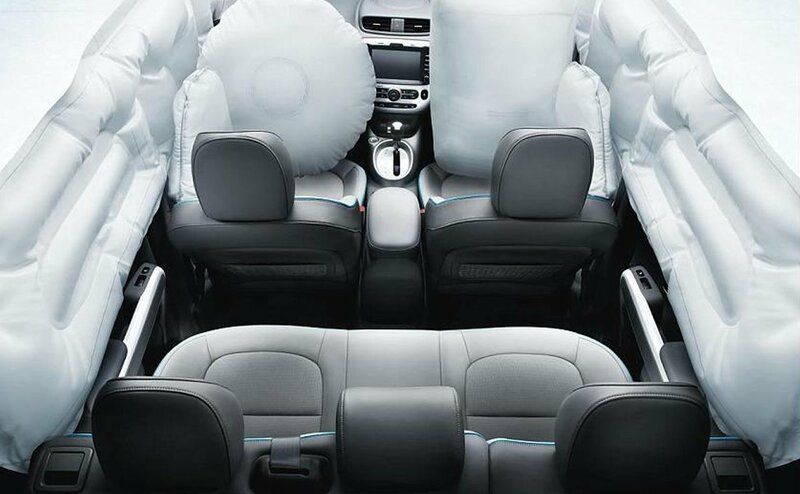 The 2015 Kia Soul is stuffed with tons of supplemental restraint systems – airbags and air curtains surround you. The Soul EV’s base MSRP is $34,500. Everything you need is standard. For $2,000 more, the Soul EV+ adds power folding side mirrors, fog lamps, front and rear parking sensors, vented perforated leather seats, heated rear seats and a cargo cover. Frankly, that’s a lot of stuff for only two grand — worth every penny. Kia is advertising a great lease deal for the base Soul EV: $249/month (about $272/month with tax) for 36 months with $1,999 down. You also qualify for California’s $2,500 rebate with a 36 month lease. 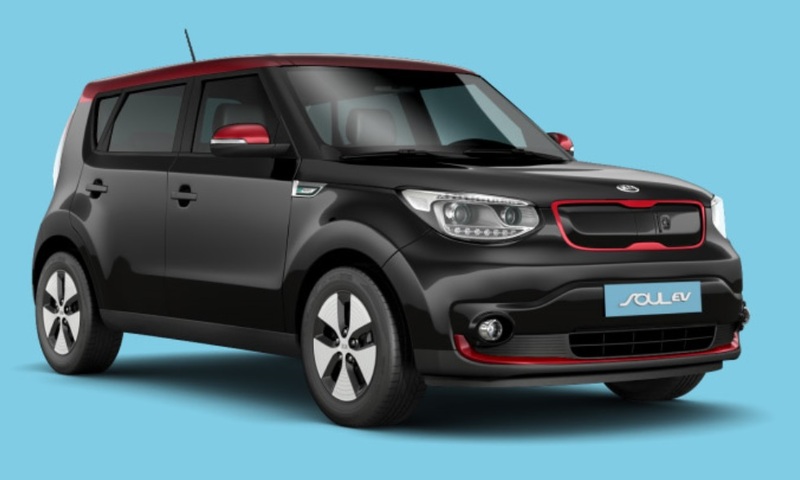 As long as you don’t expect to drag race a Tesla Model S P85D, the 2015 Kia Soul EV presents the most convincing, satisfying, affordable and uncompromised electric car since the introduction of Nissan’s Leaf. It’s at the top of the current crop of EVs and at or near the top of my list.